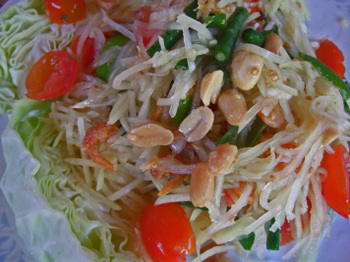 Thai Style Green Papaya Salad - mmm-yoso!!! It's been a long day......so just a short post for tonight! Lately, it seems that the Missus can't get enough Papaya Salad, She has consumed the equivalent of 5 large green papayas over the last 2 weeks, sometimes having Papaya Salad twice a day! 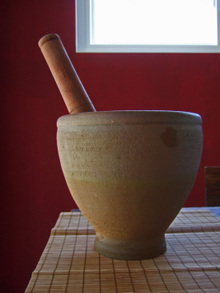 This means that the "heavy artillery", our large mortar and pestle gets put to good use. The recipe itself is quite easy, and based on the recipe in David Thompson's wonderful book Thai Food . I've varied the ingredients somewhat, mainly because the Missus and I have very different tastes when it comes to Papaya Salad. The Missus likes a lot of lime and fish sauce, and less sweet, with a ton of long beans. I enjoy mine a bit sweeter, with pungent garlic overtones and lots of tomato. Once you make it you'll be able to adjust the recipe for your taste quite easily. Oh, and watch those Thai Bird Chilies, they vary from batch to batch! Oh yes, and on shredding the Papaya...the Missus insisted that my mandolin did not adequately shred the papaya, so I ended up going to the local Vietnamese Market and picked up a $1.99 plastic papaya shredder. She swears that She can tell the difference! Pound Garlic, Chilies, Palm Sugar(works better for us this way) in a mortar. Add peanuts and shrimp, and pound into a very coarse "paste". Add lime and mash. Add tomato and long beans and pound gently until bruised. Add fish sauce and lime juice and mix. Taste, and adjust seasonings. 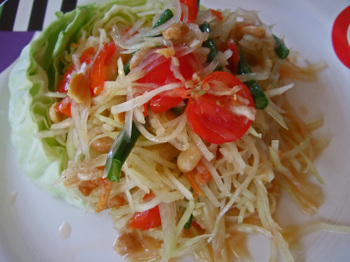 For me the ingredient that "makes" this Papaya Salad "tick" is the Palm Sugar. I think it adds a more complex sweetness to the dish. 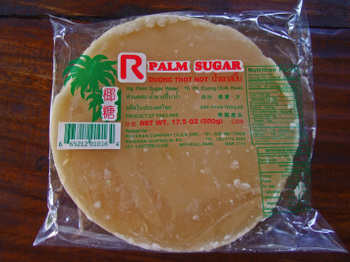 Palm Sugar can be really hard like rock, and a bit difficult to separate and portion. But David Thompson, and the one and only Chez Pim have solved that problem. 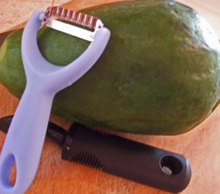 Where did you find the papaya shredder? I've been using a Japanese mandolin or a cheese grater, but it's really not the same. I think my Mrs. has the same taste in papaya; we'll have to try your version with the green beans. BTW, we tried Pho Pasteur tonight be coincidence, not having read Cathy's new post, as we were trying to try Mien Trung and that was closed at 6:30. My wife ended up picking 123A, almost the same item Cathy always gets. OMG Kirk, I have been jonesin' for papaya salad lately, esp since the weather's getting warmer! Thanks for the recipe--now all I gotta do is go find a papaya shredder and I'm all over it! I've gotten and seen that style of shredder at most of the groceries around El Cajon Blvd./University. If you don't want to drive, you might find one at Vien Dong. 99 Ranch has also had an orange one shaped more like a typical peeler, (push to peel, rather than pull). The perfect summer dish! Thanks for the recipe Kirk! Ooooh, I love papaya salad. Made green mango salad recently which tastes pretty similar. Hi Pam - Shouldn't be too hard to find a shredder, they are pretty cheap...though I'm still not convinced that using a mandolin is much different. Hi Trent - Yes, I've seen these around at every Vietnamese market. Hi Candice - Thanks! It is a very nice refreshing dish. Hi WC - oh-oh Fish sauce wars....won't go there. I do use 3 crabs, but not for my papaya salad! I like 3 crabs for cooking. Hi Alan - Well don't let me sway you...because the it's the Missus who says it makes a difference. But I recall a really good SE Asian market on Beretania who had these little handy-dandy devices! I found my shredder at a dollar store. It was sold as a tool to stripe cucumbers. Green papaya is very nutritious for women - especially nursing mothers. It's great that your missus is craving them! Hi Liz - Thanks for the info....I think Papaya Salad is just plain good for everyone! We have been searching the internet for a Green Papaya Salad. We came upon yours 2 months ago. Went to Lee Lee Market down in Chandler, Arizona and got all of your recommended items. We have been in 7th heaven ever since. We make this on Sunday and eat it 3-4 days during the week. We add some shrimp, chicken or scallops, when we want a change. Your recipe is fantastic. Can you share any others with us? Hi Robert and Ellen - I'm glad that you enjoyed the recipe. Thanks so much for letting me know how it turned out. I have a bunch of recipes on the sidebar, maybe you'll find something you'll like to try? Thanks again for taking the time out to comment, I appreciate it. For the best Som Tom I have found in San Diego, Thai Taste at 70th St and El Cajon Blvd...it's a hole in the wall but the Som Tom there is OUTSTANDING! Hi Chris - Thanks for the comment, I'll have to check it out. So far, the best I've had was at Sab E Lee in Santee.... when they had salted crab. Nowadays, I prefer mine more Issan/Lao style....kinda funky, though I still make this recipe. Actually, I picked up another shredder a couple of years back... from Thuan Phat (aka Shun Fat/SF) Market in Linda Vista - but it only cost me 99 cents. Hey, Chris. where did you get the Mortar and Pestle you used for your Papaya Salad ? ?